There are two events taking place this Saturday, January 21 that can help you become a better you. I'm sure you haven't reneged on those New Year's resolutions already, right? First up, Saturday at 11:30 a.m., the Charlotte Area Association of Black Journalists (CAABJ) is presenting "The Social Guide for Journalists," tips and strategies to become a better journalist, blogger, and overall writer in today's ever-changing world of social media. Whether you're a professional journalist, budding blogger, or just interested in learning more about social media, you're invited to attend. I'm one of the panelists (@HollidayInk), along with social media gurus Jameka Whitten (@JamekaShamae) and Davida Jackson (@Called2Connect). The event takes place at Kickstand Burgers-N-Bar, 1101 Central Avenue. Then, on Saturday afternoon, Motivation Marketing Firm, GP Events, MotherInMe.com, and Swank Group are partnering to present the New Year, New You Ladies Empowerment Event. It takes place 12-4 p.m. at Kalu, 505 E. Sixth Street, and is free for women to attend. 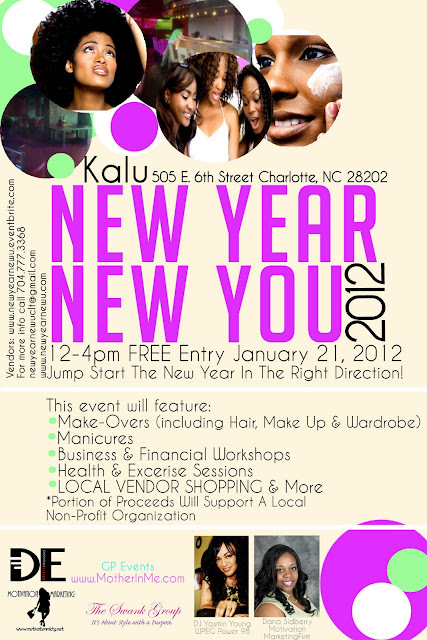 The event will feature mini workshops by beauty, hair, financial, fashion, and health professionals to help women become better versions of themselves in 2012. There will also be Asian-inspired food, music by DJ Yasmin Young of Power 98, items for sale by local vendors, live performances, and attendees will receive gift bags, giveaways, and more.